France plans to pay back costs for the Mistral helicopter carriers ordered by Russia if they are not delivered, returning €800 million and paying compensation for other expenses totaling €300 million, French media reports citing government sources. Paris is expected to fund the compensation from €2 billion that Poland will pay to buy French helicopters, according to Le Journal du Dimanche. 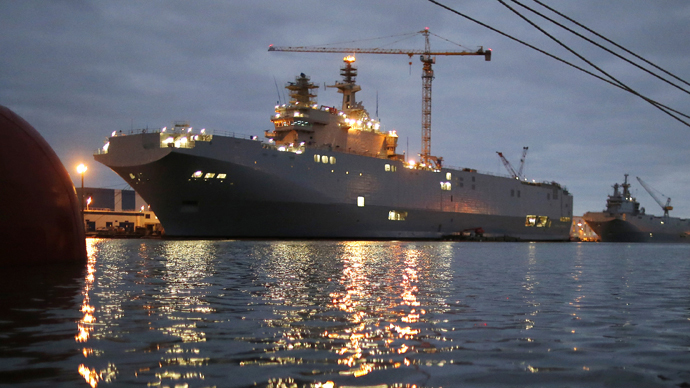 The decision on compensating Russian costs for the Mistral ships hasn’t yet been legally formalized; however France and Russia will take another month to set the exact terms of the annulment of the contract for the Mistral war ships. In addition, Russia will give France the right to resell the two helicopter carriers, the newspaper says adding that some NATO countries have already shown interest in buying them. Earlier this week French President Francois Hollande agreed that the funds should be returned to Russia if it doesn’t receive the ships. However, he added that currently it’s impossible to deliver them to Russia because of the situation in Ukraine. The contract for the delivery of the Mistral helicopter carriers was signed between the French company DCNS/STX and Russia’s arms distributor Rosoboronexport in 2011. France was expected to handover the first ship in November 2014, but the delivery has been postponed indefinitely partly due to pressure on France by the US and the EU, which imposed a series of sanctions against Moscow over its accession of Crimea and alleged involvement in the Ukrainian crisis.